Aaron Anstett’s collections are Sustenance, No Accident, Each Place the Body’s, and, most recently, Insofar as Heretofore. His new work appears or is forthcoming in cream city review, Gargoyle, The Laurel Review, Parcel, Southern Poetry Review, Zone 3, and elsewhere. Anstett lives in Colorado with his wife, Lesley, and children. To fully appreciate this poem it has to be read aloud. A silent read will take in the way the “p”s and “s”s repeat and balance each other in the first stanza; the regular rhythm and subtle rhymes (like “peck/ cement”) will chime, too, but only in the mind’s ear. Reading aloud, however, requires you to hear the poem with your body—how it vibrates in your chest and throat—in addition to hearing it in your mind. 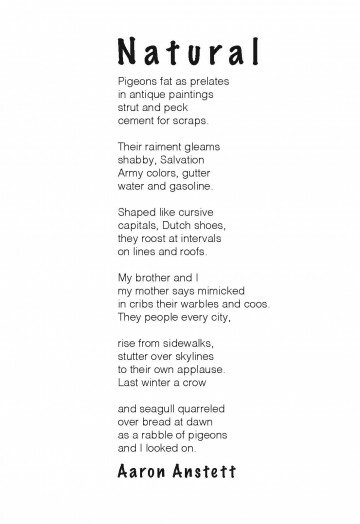 And that’s when the rhythm in phrases like “gutter/ water and gasoline” and “Dutch shoes,/ they roost at intervals/ on lines and roofs” develops an irresistible momentum. It’s also when the more subtle sound effects reveal themselves, like how the soft “c” of “cement” adds its weight to all the similar “s” sounds around it. By the poem’s end the sound is almost too loud, like the “rabble of pigeons” mentioned by the poet. A creature as ubiquitous as the pigeon needs an equally ubiquitous typeface. Helvetica is used in so many logos, advertisements and signs that it fades into the background of our daily lives. Sure it shows some variation—extra light, bold, italic—but it’s still the same typeface, as the pigeon is still the same bird whether it has an iridescent neck band or extra silvery-blue wingtips. The crow and the seagull are a slightly different case: common as can be, but sinister where the pigeons are bumbling. Shabby Chic’s version of Marker Felt is heavy on the page, a saturated black emphasized by the rounded pseudo-serifs at the end of each stroke. These are letters that will steal your sandwich while you’re not looking.